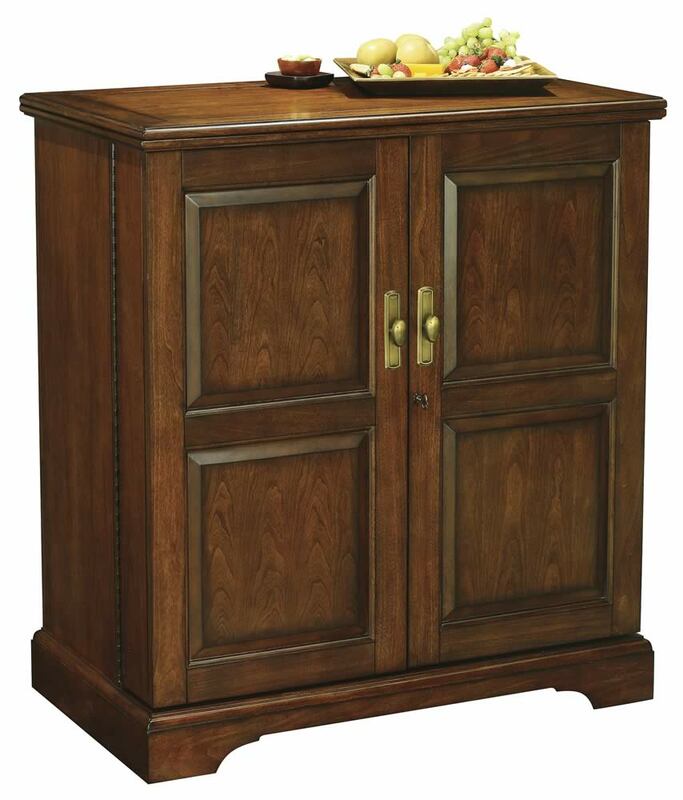 The Howard Miller Homestead 695-144 Wine & Bar Cabinet features a craftsman style finish on select hardwoods and veneers and is lightly distressed for an aged appearance. This rustic styled wine cabinet has a barn door styled sliding door and wine storage for up to 21 bottles. The door locks for added security.On the left side of the cabinet the hanging stemware racks will hold up to 15 wine glasses and the adjustable shelf allows for flexable storage. The right side has four storage drawers with full-extension metal drawer slides and quality dovetail construction. The drawers each have removable bottle racks for wine that when removed the drawer can be used for additional storage. The adjustable floor levelers under each corner allow you level the cabinet on any surface. Relaxed Classic finish on select hardwoods and veneers is lightly distressed for an aged appearance. This wine console cabinet features rustic styling with a unique sliding door, reminiscent of a sliding barn door, and a planked top surface. Wine racks with storage for up to 21 bottles. Hanging stemware racks to hold up to 15 wine glasses. Four storage drawers with quality dovetail construction and full-extension metal drawer slides. Drawers also feature bottle racks for wine that can be removed for additional storage.